Yes, that’s the TARDIS in the distance. Yes, I spent about five minutes in Photoshop making that happen. I’m pretty sure Bowie Base One is somewhere just out of the shot. Just kidding. Curiosity is in Gale Crater, and Bowie Base One is in Gustav Crater. And I have to wonder: Does the TARDIS engine sound as powerful in the thin atmosphere on Mars? 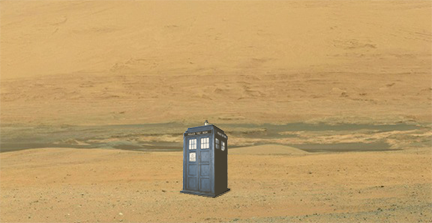 Want to see the full panorama with the TARDIS? No problem; here you go. This entry was posted in Doctor Who, Entertainment, Sci-Fi, Science, Tech by jeff. Bookmark the permalink. Awesome! I think I see Gadget Gadget just off to the left!